Although life for many Afghan women remains abysmal, some pioneering leaders are inspiring hope. Afghanistan’s next president will most certainly be male, but its future will be written at least in part by the country’s women. Since the Taliban were ejected 12 years ago, women have taken an active part in Afghanistan’s government and civil society. Women are parliamentarians, lawyers, athletes, businesswomen, musicians, and more than ever before, they are role models for a younger generation of girls. Presidential candidate Zalmai Rassoul’s second running mate was Ms. Habiba Sarabi, who stepped down as governor of Bamiyan province to run for office. While the situation for many women is often abysmal, not all Afghan women can be viewed as powerless victims. Women in Afghanistan are attaining leadership and power positions, despite being harassed and threatened for challenging fixed gender roles in a traditional society. During this transitional year for Afghanistan, women are appearing in public office and at the negotiating table. They will be a vital part of the peace-building process when negotiations with the Taliban commence. Despite challenges, risks, and targeted attacks, one thing remains clear: none of these women leaders is willing to give up what she has achieved. Anna Loshkin is a photographer and journalist based in London. To see more of her work, visit www.annaloshkin.com. 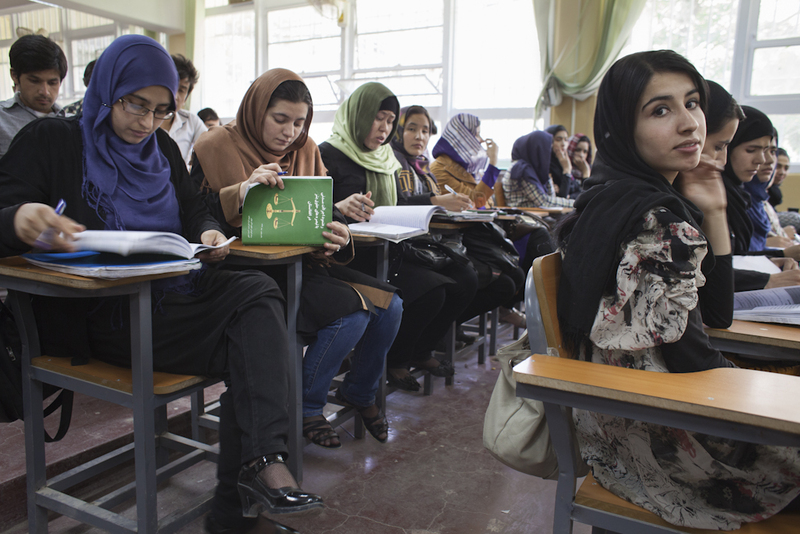 Women in their last year of Law studies at Kabul University open their textbooks as class begins. According to Oxfam’s 2014 figures, the number of women enrolled in universities in Afghanistan has risen by more than 40 percent since 2007, although it varies widely by province. 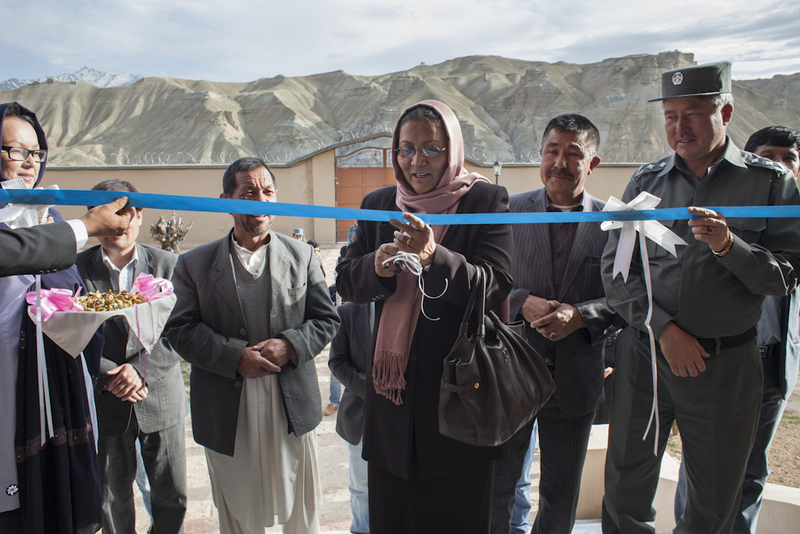 Governor Habiba Sarobi cuts the ribbon at the inauguration of the Highland Hotel in Bamiyan province. As the only female governor in Afghanistan, Sarobi worked to further women's education and revive tourism in the region. She stepped down from her post to become the second running mate for presidential candidate Zalmai Rassoul in the April 2014 elections. 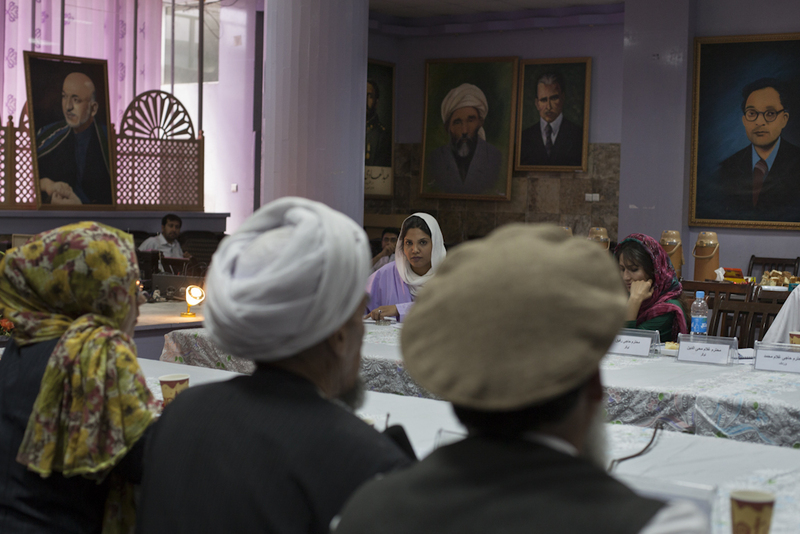 Sabrina Saqeb, co-founder of the Research Institute for Women, Peace and Security, chairs a public hearing with local leaders at the Ministry of Culture. At age 25, Saqeb became the youngest member of parliament in 2005. After serving for five years, she became active in civil society, focusing on advocacy for women’s inclusion and advancement. 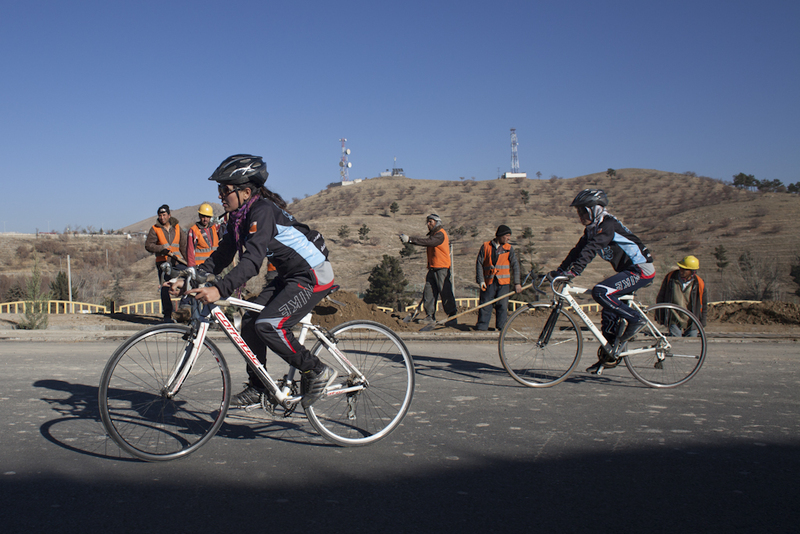 Mariam Sediqi, captain of the Afghan Women’s National Cycling Team, trains with her teammates on one of the newly built roads in Kabul. Passersby often stop and stare as the team rides by. Bicycling is considered off-limits for women in Afghan society. Paradise, the frontwoman for the rap group 143Band, practices with her fiancé and partner Diverse in the studio. 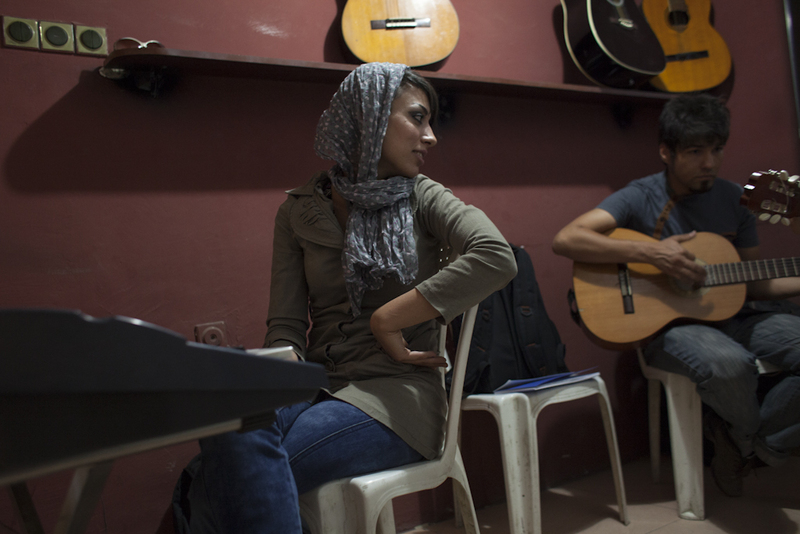 Paradise and Diverse started 143Band in Herat in 2008, but were forced to flee to Tajikistan due to threats. In 2013, they returned to Afghanistan with hopes of furthering their musical careers in their own country. Paradise and her fiancé and partner Diverse look at photographs from a recent concert with a friend. Paradise and Diverse started 143Band in Herat in 2008, but were forced to flee to Tajikistan due to threats. In 2013, they returned to Afghanistan with hopes of furthering their musical careers in their own country. 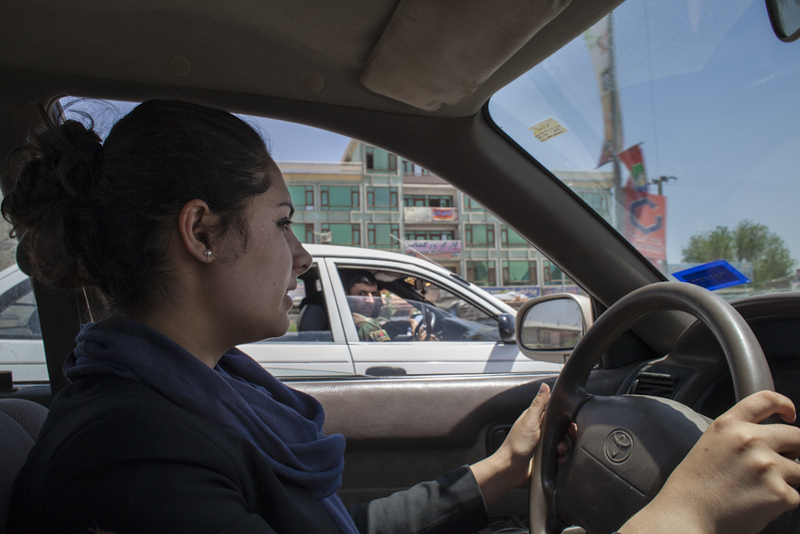 Nargis Azaryun, an activist and director of the non-governmental organization Road to Equality and Development drives in traffic in Kabul. Women drivers experience both favoritism and discrimination on the road. While they are often waved through checkpoints, male drivers may purposely try to hit their cars. 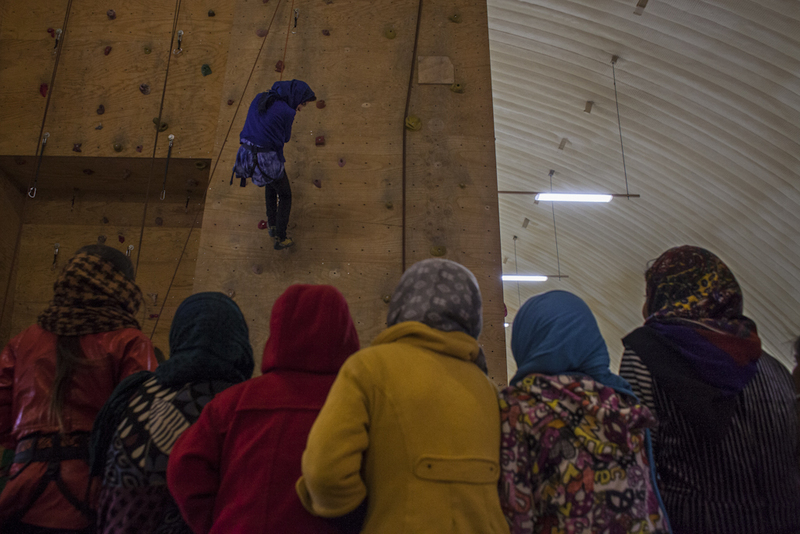 Madina Saidy shows her students how to descend from an indoor climbing wall at Skateistan, a non-government organization that promotes education and sports. Saidi first heard about the organization when she was child selling trinkets on the street to help support her large family. She has since worked her way up to a paid teaching position. 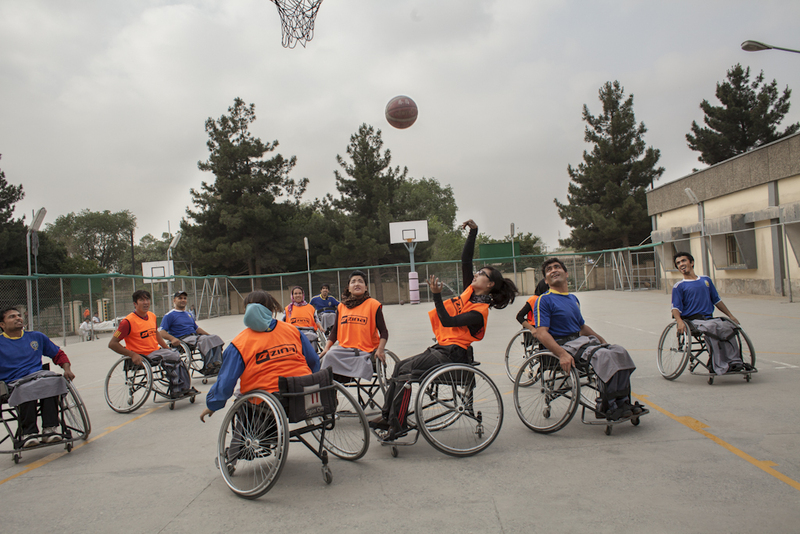 Nilofar Bayot shoots the ball during a wheelchair basketball game. Women's practice starts as early as 5 am, and sometimes members of the men's team join them for a co-ed pickup game. Bayot sustained a spinal cord injury at the age of two. Despite her handicap, she plays wheelchair basketball, is in her second year of university and works at the ICRC Orthopaedic Center, where she herself was treated as a child. Afghanistan: A Reporter's Journey Through a Winter of War Afghanistan: Facing the PollsTerror Strikes Sri LankaIndonesian Elections: Scenes From AcehIs the Taliban’s Former Capital Ready to Welcome Them Back?